Rough Skin Inflicts damage to the foe on contact. Enemy Pokemon receive 1/8 their max HP in damage every time they touch this Pokemon. Speed Boost* The Pok�mon's Speed stat is gradually boosted. This Pokemon's Speed rises one level every turn. Ruby/Sapphire If anything invades CARVANHA�s territory, it will swarm and tear at the intruder with its pointed fangs. On its own, however, this POK�MON turns suddenly timid. Emerald CARVANHA attack ships in swarms, making them sink. Although it is said to be a very vicious POK�MON, it timidly flees as soon as it finds itself alone. Leaf Green It lives in massive rivers that course through jungles. It swarms prey that enter its territory. Diamond/Pearl They swarm any foe that invades their territory. Their sharp fangs can tear out boat hulls. Heart Gold They form packs to attack boats and rip out their hulls to sink them. They live in rivers in the jungle. 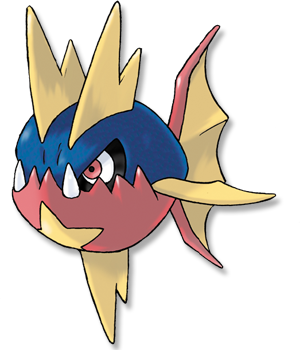 Soul Silver They form packs to attack boats and rip out their hulls to sink them. They live in rivers in the jungle.